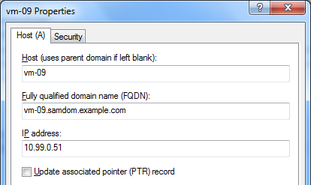 If you're running Samba as Active Directory Domain Controller, you also have to administer a DNS server. You will already find general information on the internal DNS and the BIND DLZ module and documentation about Bind as DNS Backend in the Wiki. samdom.example.com: Zone for your domain. 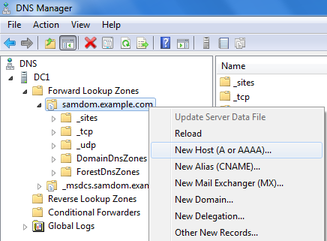 _msdcs.samdom.example.com: This is the ForestDNSZone, that contains several service records for the entire directory. The Samba internal DNS is a new implementation. Although BIND is a grown up DNS and long in production on millions of servers, the Samba BIND DLZ module is still new. That's why both backends don't yet cover all the features that you can setup with the Microsoft DNS tools. If you discover problems or missing features, please open a bug report/feature request at https://bugzilla.samba.org/. Even though the internal DNS and the BIND DLZ modules are new, they both support all basic requirements for Active Directory and more. A working Active Directory is heavily based on a working DNS. It's not just for resolving IP addresses into names and vice versa. Clients find their Domain Controller/s and other important AD services by DNS queries, this means that your clients must use your Domain Controller/s as their nameservers. Do not use anything else between your clients and Domain Controller/s. 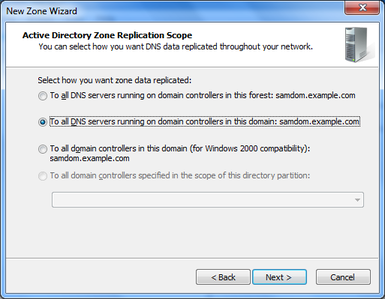 To administer DNS from a Windows client, you have to install the DNS MMC Snap-In. 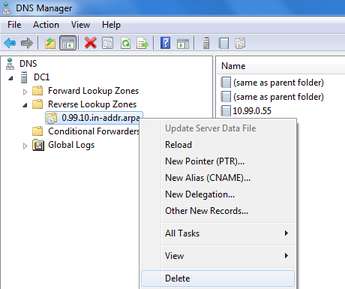 See Installing RSAT on Windows for AD Management for more details. Scavenging is not implemented yet. The error message "This function is not supported on this system" is returned. Conditional forwarders are not implemented yet. The same error message as above is returned. The DNS forwarder can only be changed in the smb.conf, not via the MMC Snap-In. Creating static records. When a static record is created it has a timestamp and the option "Delete this record when it becomes stale". In Windows Active Directory, static records have a "static" timestamp and cannot be accidently deleted. Navigate to the zone, where you want to to add a new record. Right-click to it and choose the kind of record to add. Fill the fields and save the new entry. Navigate to the zone that contains the record you want to edit. Right-click the record and choose „Properties“. Edit the entry and save the changes. Navigate to the zone that contains the record you want to remove. Right-click to the record and choose „Delete“. Right-click to a zone of which you you want to do changes. Note: Currently both DNS backends don't support all features that can be setup in the dialogues. If you discover problems or missing features, please open a bug report/feature request at https://bugzilla.samba.org/. As example we'll add a reverse lookup zone. 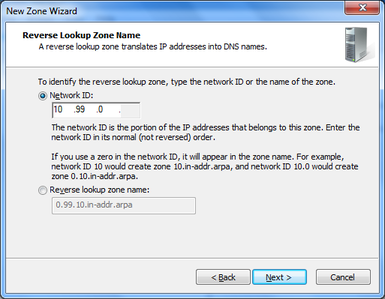 Right-click to „Reverse Lookup Zones“ and choose „New Zone“. The „New Zone Wizard“ appears. 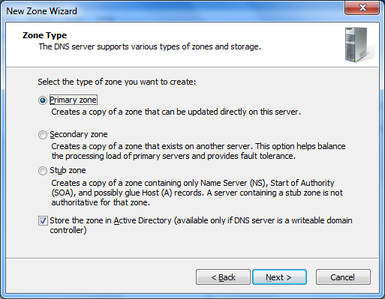 Zone Type: Select „Primary zone“ and „Store the zone in Active Directory“. Zone Replication Scope: Depends on your needs. Reverse Lookup Zone Name: Depends on your needs. 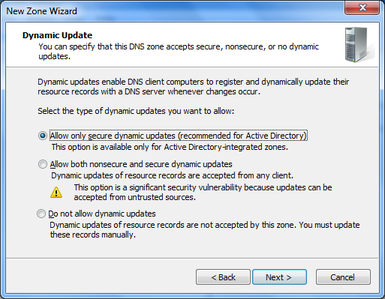 Dynamic Update: Depends on your needs. Your new zone is directly live without restarting Samba or BIND. Right-click to a zone and choose „Delete“. A note on SRV records: The order of the four parameters in the last field („data“) are 'hostname port priority weight' and have to be between ' '. See Testing the DNS Name Resolution. This page was last modified on 17 August 2018, at 15:42. This page has been accessed 130,849 times.